Hoosier politicos call it the “Wabash mafia.” And now two graduates of the tiny, all-male college in Indiana are likely to face off in the Republican primary to take on Democratic Sen. Joe Donnelly in 2018. GOP Reps. Luke Messer and Todd Rokita graduated from Wabash College just one year apart. And while neither has officially entered the race, they’re both making moves that suggest this cycle’s primary could again feature member-on-member theatrics. Republican Senate primaries have special lore in Indiana. The party is haunted by the 2012 race, when state Treasurer Richard Mourdock defeated incumbent Sen. Richard G. Lugar. In a deeply red state, Democrats later seized on Mourdock’s self-destruction in the general campaign to help push Donnelly over the edge, and they were hopeful last cycle that GOP Rep. Marlin Stutzman, a Freedom Caucus member, would give them the same opportunity. But the conservative lawmaker, who stumbled and never received financial support from the Club for Growth’s PAC, was defeated badly by fellow GOP Rep. Todd Young. Senate Majority Leader Mitch McConnell and his allies spent on Young’s behalf, fearful of the headaches Stutzman would cause in the Senate if he won. Regardless of who wins next year’s GOP primary, Democrats will be looking to make similar comparisons to Mourdock as they try to defend Donnelly in a state that President Donald Trump won by 19 points last fall. It’s against that backdrop that Messer, a speech major, and Rokita, a political science major, could face each other in a primary. There isn’t the ideological distance between them that there was between Stutzman and Young last cycle. Rather, it’s their lack of clear ideological differences that could make a Messer-Rokita matchup even more interesting, bringing into stark relief personal and stylistic contrasts that will affect their abilities to raise money and tap connections in the state. It’s a uniquely Hoosier drama in the making, with Messer and Rokita locked in a sibling rivalry. With Young, now viewed as the older brother in the delegation, having made it to the Senate, Messer and Rokita are both looking to follow in his footsteps. By all accounts, the two men have a cordial relationship. And they’ve been part of the same tight-knit Hoosier political scene since they left college. Rokita, who represents the suburbs west of Indianapolis, was elected in 2010 after serving two terms as Indiana secretary of state. His backers think his experience running statewide campaigns will give him a leg up. Messer came to Congress two years later after serving as executive director of the state GOP and in the state House. He represents the suburbs east of Indianapolis. Earlier this week, Messer announced a statewide campaign finance committee — a list of 47 business and political leaders backing him in 2018, which has been interpreted as a warning shot fired to discourage Rokita from pursuing the race. Rokita has previously considered running for higher office and then not followed though. But GOP operatives in the state think this time is different. Rokita says he’s “seriously considering” it. Spring in Indiana is Lincoln Day Dinner season. 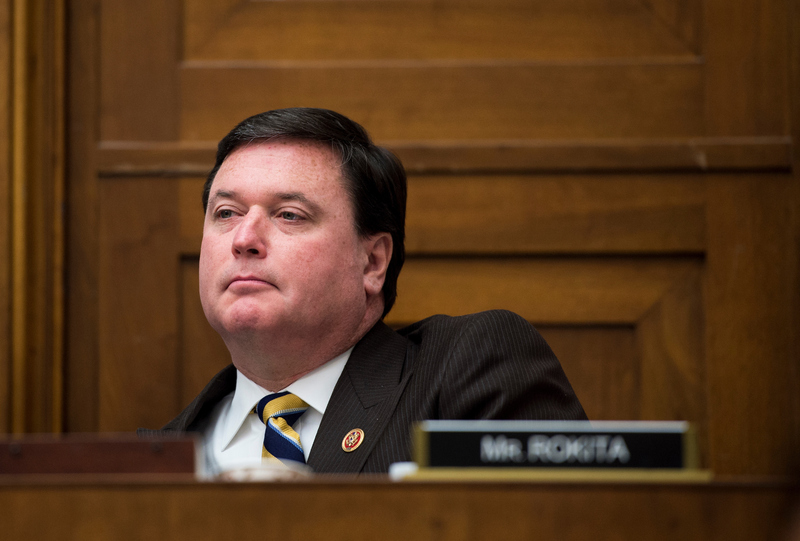 At this month’s dinners, Rokita’s allies have been handing out copies of a Newsmax story that lists him as one of the 25 “most effective” members of Congress. “So if he’s not running, they’re making a situation where people don’t forget about him,” one GOP source in the state said. Rokita ended 2016 with more money in the bank, but he knows he’ll be starting fundraising for this race later than Messer. “We started a couple of weeks ago and have had great results,” Rokita said in a brief interview in the Speaker’s Lobby last week. One operative in the state suggested Messer’s advantage will be with donors, whereas Rokita will have more sway with the grass roots. “In my mind, that’s pretty balanced,” the operative said. The roots of those divergent advantages may stem from their differences in personality. In this cycle’s race, it’d be easier to cast Rokita as the Stutzman-like troublemaker. He’s vice chairman of the Budget Committee but has occasionally butted heads with leadership, and has a reputation for being aggressive and saying whatever he thinks, sometimes abrasively. Messer is more polished, Republicans agree. “That’s probably why he’s No. 5 in leadership. It takes a certain demeanor, especially for someone with as little seniority as he has,” the same GOP source said. In recent GOP primaries, candidates have tried to run to the right by painting themselves as outsider candidates. In that scenario, it’s possible that Messer’s leadership role could be used against him. But he also has ties to the administration, with Vice President Mike Pence’s brother chairing his statewide finance campaign. A longtime subject of division in the Indiana delegation is residency. Lugar, and more recently former Democratic Sen. Evan Bayh, paid the electoral price for having moved their families to Washington, D.C. Messer, too, has moved his family to the nation’s capital. Rokita’s family is still in Indiana, which could be an advantage when it comes to running a statewide campaign. There are several other candidates in the mix — all of whom are back in Indiana. Kokomo lawyer Mark Hurt was the first candidate to officially get in the race. State Sen. Mike Delph could be interested. Freshman GOP Rep. Jim Banks ruled out a bid this week. But the real fight will be between the two members of the delegation. Walking onto the House floor last week, Rokita turned around and smiled wryly when asked how he differs from his GOP colleague. “To be continued,” he said.